Nicole and I went to the democratic caucus tonight at Leawood Middle School. It was great to be a part of the political process. We arrived around 6:50 with 7:00 PM the cutoff time to get in line. The parking lot was absolutely full and we had to park in a neighborhood five or six blocks away. We hustled over and got in a line that was about a block long. We filled out the paperwork to affiliate ourselves with the democratic party to be able to participate in the caucus. When we got in the building, we signed in, turned in our paperwork and made our way into the cafeteria as the gym was already full. The Clinton supporters were on one side of the room and the Obama supporters were on the other side of the room. 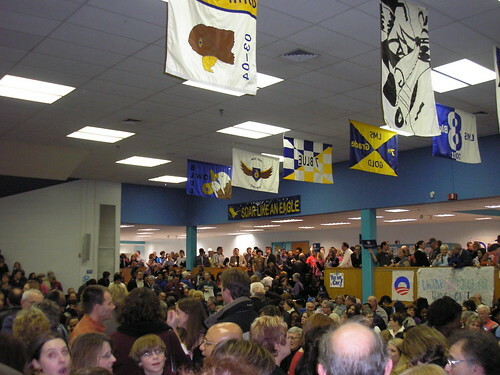 Once all of the registered democrats had signed in within the gym those supporting Obama moved to the gym and those supporting Clinton moved to the cafeteria. We heard a speech from a Clinton supporter and from an Obama supporter and then lined up to be counted. We were organized to stand into parallel lines and each line counted itself by starting on one end and turning to the person behind you for the count to continue. The results were gathered from each line and the results counted. 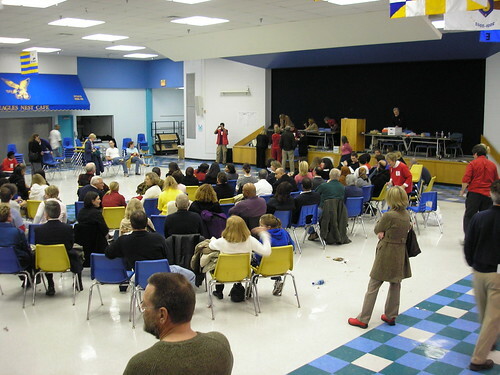 Then we transitioned to a time of electing the delegates that would represent this precinct in the third congressional district gathering in April. This was a much smaller group. We stayed until the end and really enjoyed the event. 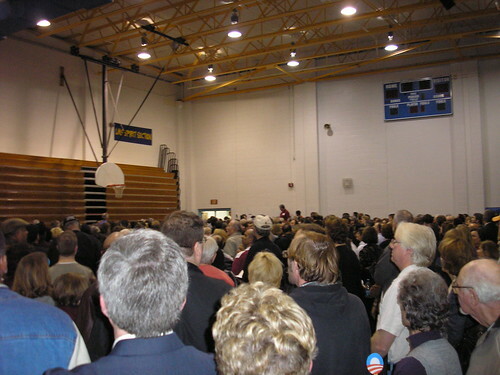 A woman at the election of the delegates said that four years ago there were 30 people at the caucus in this precint. There were over 2300 people this year. That is amazing. I do think that this is a historic year in politics. Things can change and we can be a part of it – yes we can. At the caucus in Gardner, someone made the comment “I didn’t realize there were that many Democrats in Johnson County.” I would have liked to stay for the delegate portion, but there are many hills between Gardner High School and were I live in Olathe. There was also forms of liquid falling from the sky in a freezing form. Good for you and Nicole for braving the weather in order to participate in the process! We drove by the school last night right before 7:00 and saw all the cars parked in neighborhoods blocks away. It was really quite moving. On the Missouri side yesterday, we walked right in and voted. No waiting. Go figure. Very cool. Thanks so much for sharing your experience. I have never been to a caucus. We have one coming up in Maine this weekend, but since we can’t be there, we’ve already filled out and returned absentee ballots. (I think it’s interesting that you can fill out absentee ballots for a caucus.) It is an exciting year to be observing and participating in the political process! Amanda – Thanks for sharing your experience and I am glad that you were able to find some yarn! Allen – You are welcome. I think that you are right, it is a bit strange to fill in an absentee ballot for a caucus. Whatever works! Amanda – Thanks for sharing your experience. I am not sure that we would have stayed for the delegate election, if there was not someone from Resurrection who was running.